I believe we all wish to be better and are capable of it but I also know that this is a constantly moving target – same as life. My purpose here is to help you along this permanent quest, so that you will feel alive, aware and present in your own body and mind and relationships and powerful and brave enough to live the best life you can live. I work at my office, in Bucharest, Romania but also on the phone or computer, via video calls, with local or international patients, be they individuals or couples, youngsters or adults. I can also provide counseling for teachers and other professionals in education. I am fluent in English and Spanish. You can reach me over the phone 0040 726 172 098 (leave a message if I don’t pick up) or by filling in this contact form. 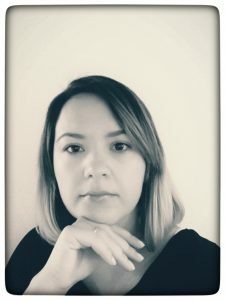 I am a psychotherapist, licensed by the Romanian College of Psychologists, and I practice since 2016, according to the Romanian laws and regulations for this profession, which are aligned to EU standards. I have a BA in Moral and Political Philosophy from the University of Bucharest (2006), another BA in Psychology from University Titu Maiorescu Bucharest (2016) and an MA in Peace Culture from Universitat Autonoma de Barcelona (2007). In 2018 I have completed a four year post grad formation in family therapy at the Association for Child, Couple and Family Therapy, in Bucharest Romania (520 hours of theory, 250 hours of compulsory personal development, 150 hours of supervised practice and a minimum of 400 hours of clinical work). Apart from that, in 2017 I have begun my own analysis process, in a psychoanalytic therapy – the most enriching and challenging instruction I have undertaken until now. Previous to working as a psychotherapist I have worked in the banking industry (2007-2015), in charge with corporate social responsibility matters for one of the top three players in the local market.